Fill a large pot two-thirds full with water. Add 1/4 cup salt. Bring to a boil. Add lobsters, and cook until bright red and almost cooked through, 5 to 6 minutes. Transfer to a plate using tongs, and let stand until cool enough to handle. Cut each in half lengthwise using a knife or kitchen shears. 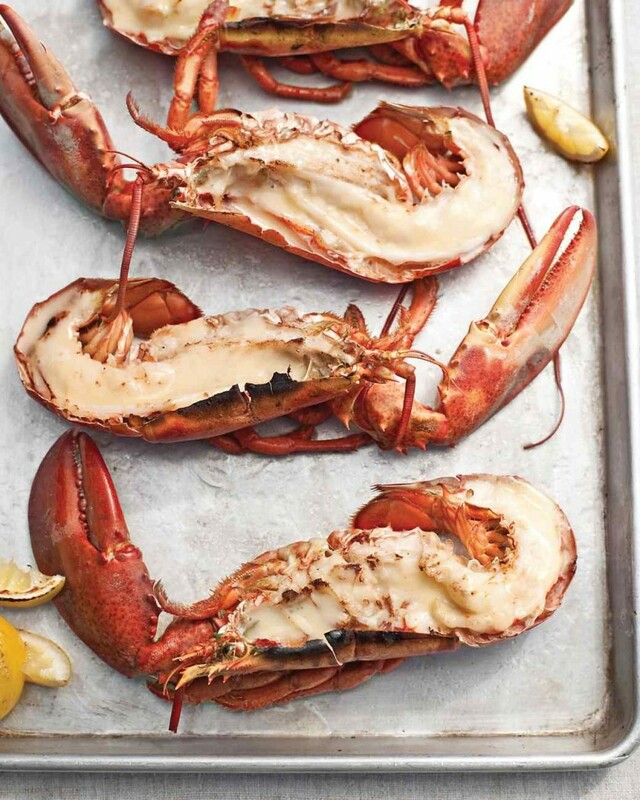 Remove head sac, green tomalley, intestine, and any coral; transfer lobsters to a rimmed baking sheet. Bring white wine, orange juice, shallot, and peppercorns to a boil in a medium skillet over high heat. Cook until reduced to 1/4 cup, about 6 minutes. Strain mixture; return liquid to skillet (you should have about 3 tablespoons). Reduce heat to low. Whisk in butter, 1 tablespoon at a time, until thick and smooth. Remove from heat. Whisk cream until soft peaks form. Fold whipped cream into beurre blanc. Season with salt, white pepper, and lemon juice. Heat broiler. Spoon half the beurre blanc over lobsters. Scatter lemons around lobsters. Broil until beurre blanc is bubbling and lobsters are cooked through, about 2 minutes. Remove from oven. Spoon remaining beurre blanc over lobsters. Serve with lemons.